A lucky fan discovered her gift to RM in BTS' new music video. 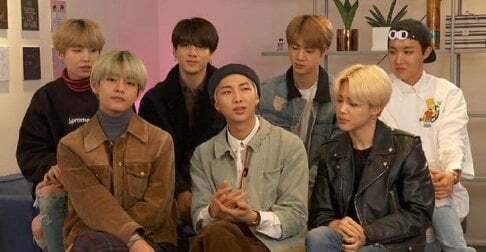 On April 12, BTS released 'Map of the Soul: Persona,' which came with an MV for "Boy With Luv." Near the end of the MV, RM in an all-white suit appears with an umbrella in his hand. An ARMY with a Twitter username MoNiJuNi revealed the umbrella is actually a custom gift she gave to RM. She explained, "The reason I gave this umbrella to Namjoon is that his performance of 'Umbrella' on 'Duet Festival' was truly impressive. In March 2018, I prepared the gift in celebration of the 3rd anniversary of Namjoon's first mixtape, and the year of the dog. It was gifted with the meaning of becoming an umbrella that protects from the rain." Fellow ARMYs commented, "What a beautiful synergy," "Your sincerity must've touched him," "Love the meaning," "This is so sweet." I am so touched 😭. Thank you k-army for making rm happy. And thank you for crashing melon 😅. Just found out that entire BTS Korean albums discography has re-entered the US iTunes chart. REALLY ARMY😆?